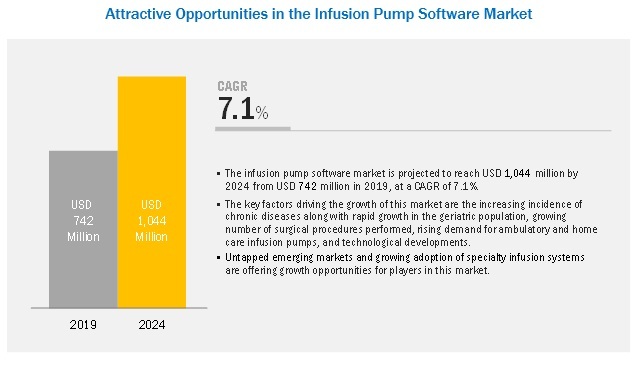 [146 Pages Report] The market for infusion pump software is expected to grow from USD 742 million in 2019 to USD 1,044 million by 2024, at a CAGR of 7.1% during the forecast period. Growth in the infusion pump software market is primarily driven by factors such as rising levels of environmental pollution worldwide, increasing government regulations and initiatives for environmental protection, privatization of environmental testing services, and increasing focus on wastewater treatment. On the basis of type, the infusion pump software market is segmented into Dose error reduction software (DERS), clinical workflow software, interoperability software and other software. The DERS segment is expected to dominate the market during the forecast period. DERS functions with the aid of the drug library which is inbuilt with the infusion pump. This software offers advanced safety features for infusion pumps and hence are estimated to grow owing to the increasing number of medication errors using infusion pumps. Infusion pump software is widely used to test the quality of drinking water, screen pesticides, and assess soil samples for contamination. The infusion pump software indications market is segmented into general infusion, pain & anesthesia management, insulin infusion, chemotherapy, enteral infusion, and others. The general infusion segment held the largest share of the market in 2018, a trend that is expected to continue during the forecast period. The large share of this segment can be attributed to the safety and efficacy provided by infusion systems for the suitable delivery of medication in patients for the various general health conditions. Factors such as the high adoption of specialty infusion pumps and software for treatment of chronic disease, increasing prevalence of chronic diseases along with rising ageing population, and presence of many large hospitals are driving the growth of the infusion pump software market in North America. The major vendors in the global infusion pump software market are BD (US), B. Braun (Germany), Baxter (US), ICU Medical (US), Terumo Medical (Japan), Fresenius Kabi (Germany), Moog (US), F. Hoffmann-La Roche (Switzerland), Ypsomed (Switzerland), Medtronic (Ireland), Smiths Medical (US), and Micrel Medical Devices (Greece). In March 2018, Baxter partnered with First Databank (FDB), US, with the aim of integrating FDB’s Infusion Knowledge, an evidence-based library of IV medications, into Baxter’s Dose IQ Safety Software to help make delivery of infusions safer. In August 2017, BS expanded in the US with the launch of BD Institute for Medication Management Excellence in New Jersey, which aims to improve patient safety and outcomes. In collaboration with national experts and IV safety organizations, this new institute would initially focus on enhancing end-to-end IV infusion Safety at the patient's bedside. Which of the software segment will dominate the infusion pump software market in the next five years? Emerging countries have immense opportunities for the growth and adoption of infusion pump software, will this scenario continue in the next five years? Increasing availability and awareness of advanced technology in the emerging market is impacting the growth for developed markets. How will the pricing difference impact the overall market? What are the upcoming technologies in the infusion pump software market? In the secondary research process, various secondary sources such as Hoovers, D&B, Bloomberg Business, and Factiva have been referred to, so as to identify and collect information for this study. These secondary sources included annual reports, press releases & investor presentations of companies, white papers, certified publications, articles by recognized authors, gold standard & silver standard websites, regulatory bodies, and databases. After arriving at the overall market size-using the market size estimation processes as explained above-the market was split into several segments and subsegments. In order to complete the overall market engineering process and arrive at the exact statistics of each market segment and subsegment, the data triangulation and market breakdown procedures were employed, wherever applicable. The data was triangulated by studying various factors and trends from both, the demand and supply sides, in the infusion pump software industry. To track and analyze competitive developments such as product launches & approvals, expansions, partnerships, agreements & collaborations, and other developments; in the infusion pump software market. Thermo Fisher Scientific Inc. (US), Agilent Technologies (US), Shimadzu (Japan). Major 10 players covered. This research report categorizes the infusion pump software market based on type, indication, end user, and region.